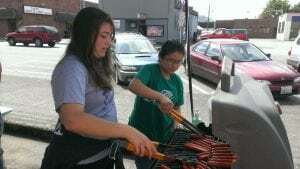 Keystone Club teaches the value of community service. Teenage members of the Sedro-Woolley Boys & Clubs get the opportunity to do more than just hang out after school. Taking ownership of their Club, and effecting positive change, members engage in Keystone Club. This national program of Boys & Girls Clubs focuses on service and leadership, and provides the opportunity to get involved throughout the community. Every Friday afternoon President Shaely Spilker, Vice President Jazzelle Elias, Treasurer Hallie Simpson and any Club member who wants to be involved meet and discuss upcoming service projects, fundraisers and ways to improve the Teen Center. A staff advisor participates in meetings but it is the members who ultimately decide what projects to focus on. Recently they rose over $600 for the Boys & Girls Club between two fundraisers, the True Value anniversary and Blast from the Past, both held in Sedro-Woolley. Coming up, they will be participating in a hamburger fundraiser at the Sedro-Woolley Eagles on the 4th of July. Earlier in the school year, they also had the opportunity to sell programs at Century Link field during the Seahawks vs. Cowboys game as part of the Spirit of 12 program, which allows non-profits to raise funds through program sales. Beyond just fundraisers, the Sedro-Woolley Keystone Club also does community service projects. This year they have done several projects with the Skagit Land Trust pulling ivy and helping to plant trees, including participating in their Earth Day event. They are currently planning on having a book drive during summer vacation and hope to do a food drive during the next school year.